As bookmakers, we are continually involved in the creative process of deciding the form and function of our books. One style of bookmaking is to try to be historically accurate in methods of binding. Take that several steps further and imagine using only materials available in the middle ages. Forget about paper—try preparing your own calfskin or goatskin vellum for the pages (see below) and wood from a tree in your yard for the covers. And you want to add text? No computer, letterpress or gocco printers available to use here. You must carve your own writing quills and grind your own pigments and inks as well. Oh, and did I mention the text would be the entire Bible? 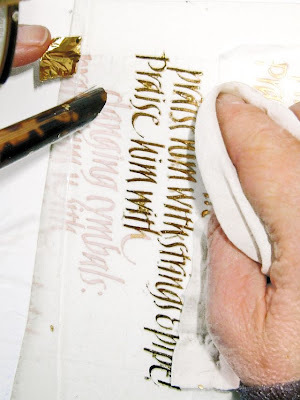 While this would be a monumental and unattainable task for most of us, it was the vision of Donald Jackson, one of the world’s foremost calligraphers, and Saint John's University in Collegeville, Minnesota. Donald Jackson with voiceprints used in the Psalms. The digital voiceprints show how we might “see“ the music. Copyright The Saint John’s Bible St. John’s University, Collegeville, Minnesota USA. Used by permission. All rights reserved. 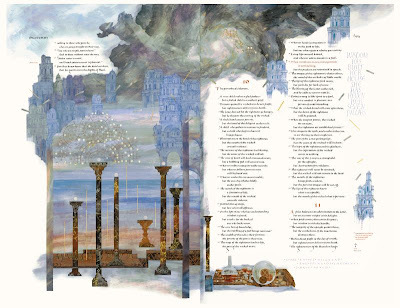 It was Donald Jackson’s lifelong dream “to create the first handwritten, illuminated Bible commissioned since the invention of the printing press. 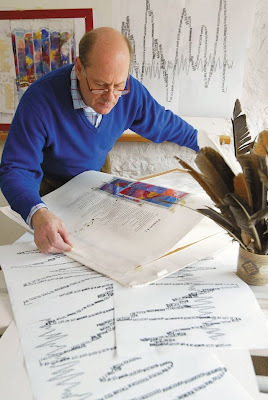 The Saint John’s Bible uses ancient materials and techniques to create a contemporary masterpiece that brings the Word of God to life for the contemporary world.” For the last nine years, Donald Jackson has been working with a team of calligraphers and artists in Wales. The entire project is to be completed by 2010. 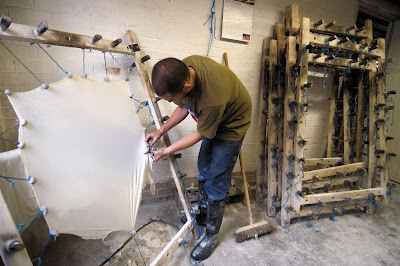 Stretching the vellum skins. Used by permission. All rights reserved. You may be wondering “why bother?” with hand craftsmanship for a project of this magnitude in the digital age. “The Saint John's Bible, consistent with the educational mission, values and vision of Saint John's University, is a spiritual, educational and artistic endeavour and a significant contribution to the new millennium.” You can read more about the vision statement here. Sally Mae Joseph gilding with gold leaf. Used by permission. All rights reserved. 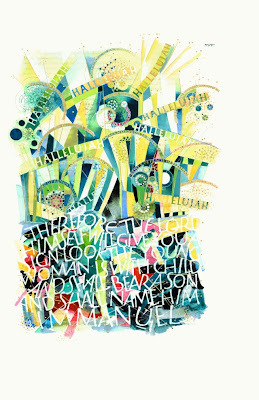 An exhibition of selected completed pages, Illuminating the Word: The Saint John's Bible, has been touring nationally (US) and internationally (Canada and UK) since 2006. Winnipeg was the only Canadian city chosen to host the exhibition (from April 12 to June 8, 2008). I was able to view this exhibition several times and was continually amazed by the exquisite calligraphy, exceptional illustrations and the scope of the work. My personal favourites were pages illuminated by Thomas Ingmire. Messianic Predictions, Thomas Ingmire, Copyright 2006 The Saint John’s Bible and the Hill Museum & Manuscript Library, St. John’s University, Collegeville, Minnesota USA. Scripture quotations are from the New Revised Standard Version of the Bible, Catholic Edition, Copyright 1993, 1989 National Council of the Churches of Christ in the United States of America. Used by permission. All rights reserved. Each two foot tall and three foot wide page is a piece of art in itself. Seven Pillars of Wisdom (two-page spread), Proverbs 8:22-9:6, Donald Jackson. ©2003 The Saint John’s Bible and Saint John’s University, United States of America. Scripture quotations are from the New Revised Standard Version of the Bible, Catholic Edition, copyright ©1989, 1993 National Council of the Churches of Christ in the United States of America. Used by permission. All rights reserved. Upon completion, the more than 1,000 pages will be bound into seven distinct volumes and will be used in worship in the Abbey. Check the exhibition schedule for dates and times in your locale. If you can’t make it to one of the exhibitions, each page can be viewed online under Custom Prints. More information can be found on the comprehensive website. Wow, that's a tremendous project! Laura, what a treat to be able to see some of the completed pages first hand. Thank you for sharing this - it was utterly fascinating to read and see! Awesome!! Thank you for sharing this. Fascinating. Re:Paper wins BEST Zombie Award! What Brush is Best for Glue?